The Jacobean Air Twist Flute Champagne are a timeless, elegant style, mouth blown and handmade. A perfect way to enhance and celebrate that very special occasion. 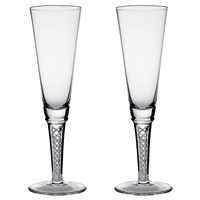 Set of 2 champagne glasses with feature spiral air twist stems, made from 24% lead hand cut crystal. Gift Boxed.